On a rainy day in Seattle, I had an opportunity to sit down with film maker Yixi Sun to discuss her debut feature film Susu which is an official selection of the 2018 Seattle International Film Festival. Her insight and knowledge of film making is very impressive and it is obvious she has a sincere passion and joy for her craft. Our discussion covers a wide range of topics including how she made the movie, what it was like starting her own film festival, and her newfound love of popcorn. To start off, where did the idea of the movie come from? First of all, I am from Beijing. I moved to London to study and I stayed there to work in the film industry for many, many years so for my first time to write and direct a feature film I wanted to bring in what I am interested in. For example Kunqu Opera, English lifestyle, big houses, beautiful oil paintings, and fashion jewelry. You see all of this in the film. None of it is there by chance, it's all what I would like to share with the audience. Another thing is I wanted to make a psychological thriller. Psychology is an area I am interested in and I feel like I have watched many films in the genre. I like the British films from the 1960's and 70's and my producer Norman (J. Warren) was a very famous film director from that time. I was hugely inspired by his work, by Hitchcock's work and a lot of other European and British films. I would like to use what I have learned from this country and what I was inspired by in one story. To me that was challenging but it was great fun. You mentioned Hitchcock. Were there any specific movies by him that were a direct influence on your film? Not any particular film from Hitchcock. I watched many of his works and I enjoy the stories, I enjoy the acting, but I hadn't watched all of his films. When we showed this film to an audience, I still remember, the first screening people said wow, it looks like Psycho. I said oh really so I went back to watch Psycho because I hadn't watched it before. I was scared. I was like no, what if it's the same film! Later on, I found out, okay that's a different film, I'm safe. It was funny but I was so sorry because I hadn't watched that famous film. I didn't even know the leading part in the film was named Norman and my producer's name was Norman too which of course was a coincidence. To me it was dangerous because I thought people were saying it's a remake, but it's not, you just got the same feel as that movie. Tell me about the locations used in the film. It wasn't only one location, it was a few locations that we put together and some very important plots happen in the different locations. We smartly put them together to make it feel like it was one perfect location but actually to take many locations and make it look like one perfect location, that's a difficult job. The other thing is I love all the locations we used. The main location, which was Charles Chaplin's home in London, now is a cinema museum and I just love it there. The first time I stepped into that museum, I feel like that's great, I must make a story happen in here. Another one is a 16th century castle located in Birmingham that came last in our production because at that time we wanted to find the luxury and a big house but a lot of the ideal places were not affordable. We really needed a place with a touch of history and we almost gave up but then at the last moment we found the right one so it was fine. You were involved with everything from writing and directing to editing the movie. What would you say is your favorite part of the film making process? Directing and then writing. Editing is such a lonely, difficult job. I enjoy it too but it's not good for your well being or healthy lifestyle. It's very sensible that an editor shall be paid very well because it's a hard job. Your cast is very diverse with people from a lot of different places. What was the casting process like for this movie? I think we did it in a very traditional way. We had our Chinese producer introducing actors and I have friends in the Chinese film industry so everyone was introducing actors to us and we hosted an audition session in Beijing. Everything was done in front of camera no matter whether they are name actors or not, everything is done in a traditional way where they needed to do an acting session or audition. In London we had a casting director and for each role, I think we saw twenty to forty different actors but eventually one is the most suitable one. What was the most challenging aspect of getting the consistent look and feel that you wanted? In editing I think it was already pretty good. If you are the director and editor, from the filming side, I already know what I need so I won't put myself in a difficult situation in the editing room. When I was in the editing room, I would like to say thank you to the old me that was on the film set for getting everything. Because we are a low budget film, for every shot, we could only do like three or four takes, there was really no luxury to do more. The camera angles were so limited because there was no luxury to change the angles. Sometimes I want a closeup but there was just no time. For low budget films, especially your first film, that happens and that's the challenge. Some well designed shots, we couldn't make happen because of this. What is good is that it's like practice and you really need to find the solution and finding a solution is great fun. When I am in the editing room, sometimes I need to take a little bit from where it's supposed to be wasted material. It's like we've already said cut and the camera still runs but we still get something there so everything gets used. How much thought and preparation did you put into getting the look and style that you wanted given the limitations of it being a low budget film? Um, with lots of tricks. I think that's the main thing about low budget film making. Low budget doesn't mean it looks cheap, it means you may not have lots of resources or money to spend on it but it has nothing to do with the final quality of the film. You can still make it look brilliant. That's the challenge and that's the interesting bit of the work. To be honest, there is lots of support from colleagues, from cast and crew, from friends and family, and everyone, but that's why we also have the pressure because if the film looks awful then we wasted this kindness so that's one thing. The other thing is in front of the camera. Everything is like, you have tricks, you can make it look different by changing the camera angle. When you use a different lighting, things look so different like the jewelry. It's not special jewelry but when you use special lighting and from a certain angle it looks like luxury. That's the amazing thing about films. Films are like magic! Aside from now being a feature film director, what is your background in the film making industry? I think the first thing is I'm not like a fresh graduate. I've been working in commercials and documentaries for such a long time, for about ten years and I have two degrees in broadcasting and film making. Also, I've been writing features so it's really no excuse. Technically, this can not be a bad one otherwise I would hate myself, it means I'm so silly but as a first film, for sure I know what is not good enough and what is a lot of space to improve for sure. 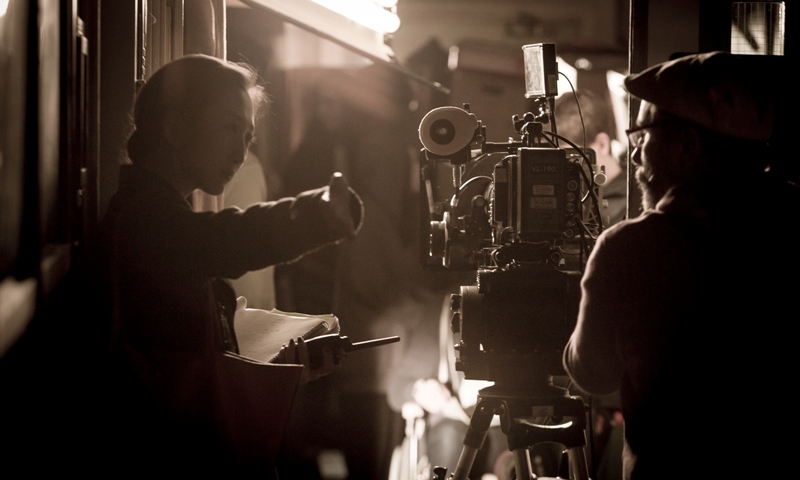 Making a film, whether it is low budget or not, you've got investors who are involved. You've got sixteen hundred people who are involved. If it looks like a student's work, I mean that's awful. In 2007, you founded the Filming East Festival in the UK. How did that get started and what was it like creating a film festival? I think it's great because more and more people are asking me about the film festival. People outside of China ten years ago, most of them had no concept of what Chinese language films were like. When we started showing Chinese films in the UK at that time, we didn't start in London, we started from the other cities and towns in England. These cities didn't have a chance to see Chinese films and we felt like, we were film students, we work in this field, and now maybe we can do something more constructive. It was a very simple idea and we got some support from Film London, Creative England, Film Council, those UK organizations and after that a lot of Chinese people and organizations supported us. It's a charity, no profit, so everyone who works on it are volunteers, we don't make any money but we use the money to smartly program the Chinese films. The main idea is not to bring the big films to entertain the Chinese audience in the UK, but to introduce some good films to the Western audience who is in the UK. At the very beginning, we started from Oxford and for one screening there might be only four or five people and now, for one screening, we work with big organizations like BFI and we got a full house like two hundred, two hundred fifty, a full house for a Chinese film! Also, because of this experience, I have gradually built up my knowledge about what type of Chinese films would be accepted or would be popular in the West and that's quite different from our imagination. That field needs some thought and research, it's so different from ten years ago where I believed which type of film would work but actually now I know what could work. I've had a huge benefit from my festival programming experience so now I feel I would like to be with the audience. I don't make films like the lonely artist. I like cinema. I like the audience. What was the initial reaction ten years ago from film makers in China when you would approach them about the film festival? When we started, there was nothing there, we couldn't learn from any other experience so we did everything we could do. We talked to friends and, because I did my degree in China, I talked to my school mates. We were in the field so it's not like we were outsiders, we were involved. Because of this I would just tell everyone and then we also worked with professional organizations in China like film foundations and film companies. We got a lot of submissions, really a lot so it worked out well to fill out the whole week but it was still very difficult to run the film festival. We needed a lot of support financially which was a big challenge. Sometimes it would get smaller and sometimes it would get bigger but now we can, we might not be as big as in previous years, but now we are doing really good because we know what type of films people want to see. We'll do one screening for a film where the audience is much larger than if we screened it the whole week. Now that you are directing films, how do you balance that with running the film festival? I think I've always seen myself as a film maker, I look at it like that's my profession, that's my job. In the future I will be very concentrated on one thing and that's writing and directing. Filming East is an NPO and we have a team, especially young people, they are doing it and some of them their background is film and they are creating their profession. They are very passionate so I will do everything to support them and they will be the main programmers for Filming East. Filming East will be there always to do more. I believe we can offer more, personally I will be a supporter to the young generation who will run the business. In the future, are you looking to explore different genres as a film maker? I like this genre so I will keep watching these types of films but for my work, I will try different things like we know Peter Jackson's first film was horror but then he made Lord of the Rings. I've learned so much from making a horror film and I've been learning the tricks about story telling so I will use that in my future projects. The next one is a love story and after that it might be a sci fi but deep down it's telling a story and that's it. It's always about people no matter the situation. Are you getting different reactions from different places in the world where you have screened the movie? So far, yes, I think people's reactions are quite different. That's why I think I really enjoy attending film festivals in different places and I go to every screening. I really couldn't see the film one more time but I will always go to see people's reactions at the end which is fun. For example, people's reactions here are so different from people in London or Beijing. In China no one would show their emotions so you can't tell if they are sad or happy or if they liked it or not. They won't tell, you need to ask and then they will tell you. Showing emotion to the public or to anyone, it's not part of the culture. In America people seem to be more loving or maybe it's just because we are at the Seattle International Film Festival which is the perfect place for film lovers. Our screening today was on a Friday morning, a Friday morning, so I was thinking no one will come! I was so amazed because we almost had a full house, it was a surprise. There were lots of people with popcorn, I mean I love it, they have popcorn which is nice. In England people will get popcorn if it is a blockbuster Hollywood film but if it's more of an art house type of film, eating is not okay. Before coming here, I didn't know if I would like seeing people eating during my screening, but now that I've experienced it, I like it and I was thinking ice cream might be even better! I mean, to me it's like I would want to learn that people think my film is entertaining. That is kind of something that would encourage me. I really like this word, "entertaining" and popcorn is entertaining so now I really enjoy it. By the way, there are so many different flavors in Seattle. Is there any type of message you want people to get from watching the film? That's a very good question because a lot of people ask me this question and every time I give people different answers. Sometimes I say I want people to see my film as beautiful and they can be engaged and they can be touched and sometimes I say I want to scare them and sometimes I say I want them to see what a Chinese film maker could offer but I don't know why every time I give different answers. Actually today, after the two screenings here in Seattle, I do think the right answer would be I would like to get different opinions. You make a film and different people see different things and, if I have an expectation, it's not as true as if I want to see different people's feedback. I can not expect the same feedback from a teenage girl as I would get from a retired Chinese soldier. It's so wrong to try and stereotype your audience and I really enjoy people's very different views. That's a way of communication and that's the interesting thing is to see what your baby is doing. Thank you for chatting with me and enjoy your time in Seattle! 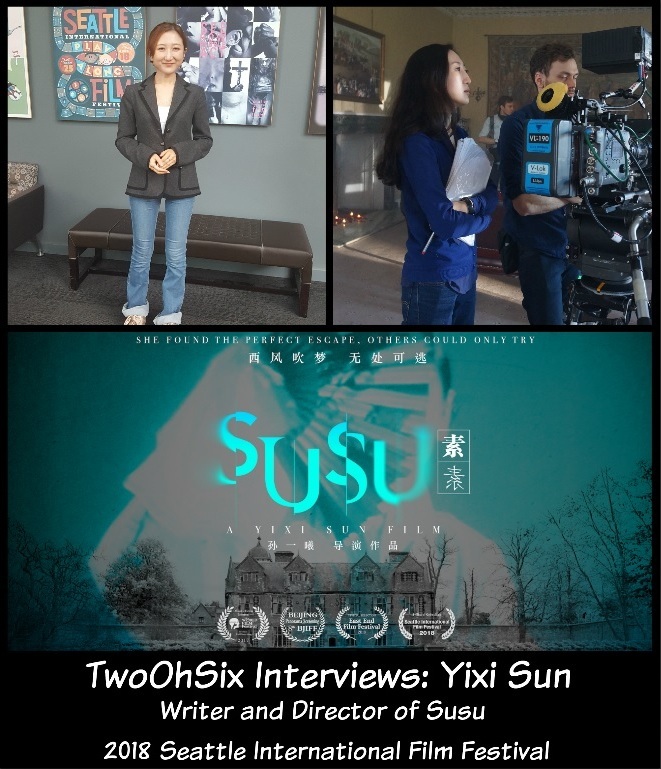 Susu is an official selection of the 2018 Seattle International Film Festival.